Up A Lazy River and Mariner’s Compass are both quilt patterns with a water theme. This block was designed in honor of Fulton County, Pennsylvania’s Meadow Grounds Lake. It is located west of McConnellsburg, within State Game Lands 53. The lake was completed in 1965 and covers 204 acres. Its beauty is loved and appreciated by nature lovers and sportsmen far and wide. A special thank you and recognition goes to the Friends of Meadow Grounds Lake and all those who contributed to securing the future of this lake. State Game Lands No. 53, contains 5,901 acres. Its terrain is hilly, to mountainous and heavily wooded. 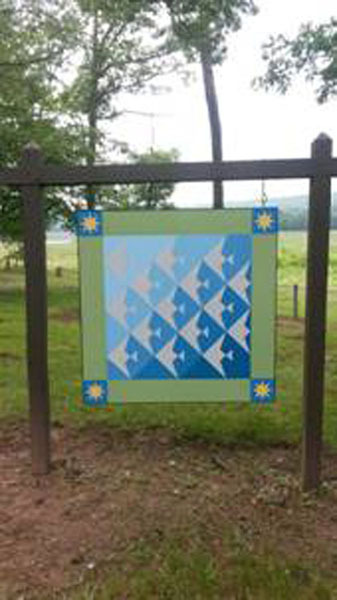 The green border of this quilt patch is representative of the Meadow Grounds, surrounding the lake, where the most prevalent game species are deer, turkey, squirrel and grouse. There are several trails within this State Game Land. A beautiful hike along the Roaring Run, which hangs in the valley between two mountains, will reward adventurers with a view of the Roaring Run Falls. Starting at the Jarrett Trail, below the dam spillway, this hike is about 3.25 miles out and back.